The equipment that brings up the ad to potential customers is called an Ad server. 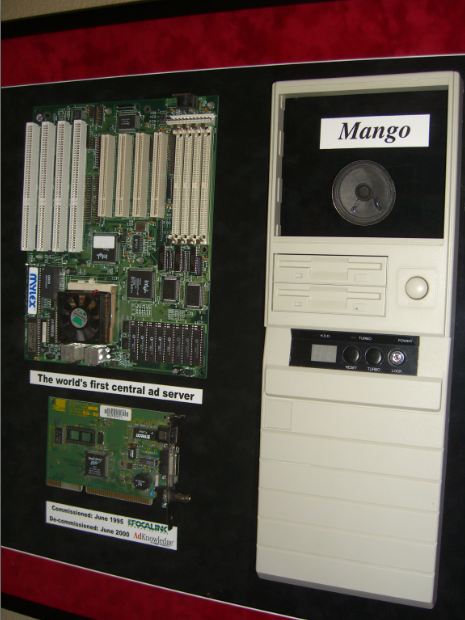 The first central ad server was released by FocaLink Media Services and introduced on July 17, 1995. An ad server is a computer server, specifically a web server, that stores advertisements used in online marketing and delivers them to website visitors or users. The content of the webserver is constantly updated so that the website or webpage on which the Ads are to be displayed contains new advertisements every time (when the site or page is visited or refreshed by a user). The one of the purpose of ad serving is to deliver targeted ads that match the website visitor’s interest. Ad servers bring a new innovation in how publishers can measure their website traffic and the functionality of them is growing in providing techniques that allow the publisher to be more marketable to their clients needs. There are several types of ad server techniques: ad targeting, behavioral targeting, and ad metrics. Behavioral targeting : Behavioral targeting occurs after the target market of the ad is determined. It is defined as specifying ads to different links that have a similar interest that a user visits frequently. Ad Metrics : Ad metrics notifies ad traffickers when the stats for ad views are low and prompts them to discuss new ways of reaching the company’s target market for the product being advertised. 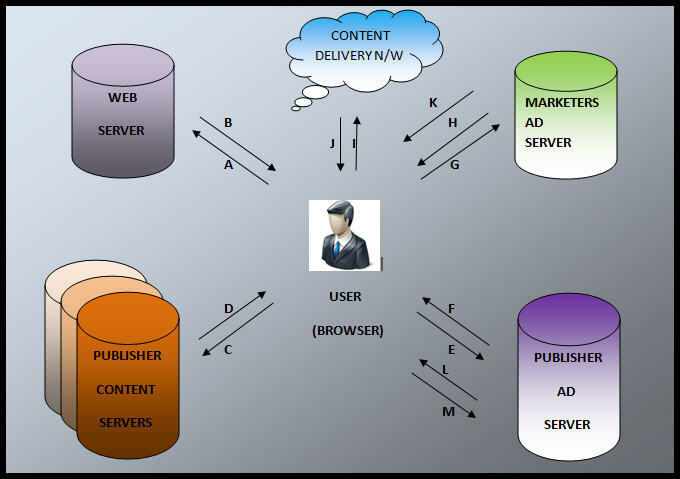 REMOTE SERVER : Servers run by third party which helps in serving the Ads across domains owned by multiple publishers. They deliver the ads from one central source so that advertisers and publishers can track the distribution of their online advertisements, and have one location for controlling the rotation and distribution of their advertisements across the web. LOCAL SERVER : Local ad servers are typically run by a single publisher and serve ads to that publisher’s domains, allowing fine-grained creative, formatting, and content control by that publisher. The first central ad server having Pentium 66 processor was named MANGO (image below). Focalink re launched the ad server under the name SmartBanner in February 1996. Track the number of impressions and clicks delivered by each campaign. Prevent campaigns from appearing on pages with semantically controversial content. Optimization and tuning for better results. (A) – When a browser navigates to a publisher website , (B) the publisher’s web server sends back a bunch of HTML code . (C) – The HTML code tells the browser from where to get the content i.e from which content server. It also tells the format of the content on the page. (D) , the content server returns the content on the page or browser. The part of the HTML code returned to the browser also includes a coded link known as an ad tag. (E) , the link redirects to the publisher Ad Server which (F)returns an Ad to the browser. There are times when the publisher Ad server sends back another ad tag (link) which redirects to a marketer Ad server from where the Ad has to be fetched. These redirects are temporarily redirects , technically 302 redirect. (G) – The browser now calls the Marketer’s Ad Server which itself (H) returns with a link to content delivery network i.e CDN which is a global network of cloud servers that actually house the raw creative graphics to fetch the actual ad. (I) – The browser redirects to the CDN , (J) which returns the creative or Ad to the browser and the relative Ad is shown to the user. (K) – One more important step that occurs when the Market Ad server returns the CDN link is that it also send the redirect link of a 1×1 image. (L) – When the browser fires this last redirect calling a 1×1 pixel from the Marketer’s Ad Server , (M) 1×1 fires. NOTE : *Once the publisher’s adserver sends the browser a redirect to the marketer, it counts a delivered impression in its own database. *When the browser fires this last redirect calling a 1×1 pixel from the Marketer’s Ad Server, the Ad Server knows the ad was successfully downloaded and it finally counts an impression in its own database also. *Clicks are tracked in much the same way as impressions, with redirects.